As we begin Holy Week, Christians throughout the world will journey from the agony of crucifixion to the joy of resurrection. It is, of course, the most significant time in the liturgical year and the very heart of our faith. Yet we must also pause and give thanks for the unsung heroes of this whole operation: the hardworking parish copiers and those who dutifully operate them. When the copier inevitably jams or runs out of toner or stops working altogether in the midst of cranking out the Easter Vigil bulletin, it is the parish secretary who stands on the front lines of Holy Week. He or she lovingly coaxes this essential machine or screams at it or sings incantations over it. While it’s true that Easter never failed to arrive on account of a broken xerox machine, these beasts of burden will be taxed to the limit this week. And in the process, much hair will either turn gray or be yanked out by the roots. Thus, as I have in years past, I offer a poem in honor of these vital machines in hopes that they will be up to the task. Sure Christians survived without copiers for nearly 2,000 years. But let’s face it — without the bulletins they produce most of us would be left in the liturgical dark. Oh, and don’t forget to thank the parish office staff (though I recommend doing so next week after things have calmed down). From Trinity, Boston to All Saints’, Tenafly. on fingers and walls and the office floor. in the week when your workload is over the top. save some for a techno-exorcism! Mary, this is brilliant! Of course, I’d expect nothing less from the Poet Laureate of Lent Madness. Feel free to share–writing that was just so much more fun than working! Thank you…thank you…thank you…..it helps to know we are not alone. As I sit here waiting for the copier repairman as my machine broke down in the middle of…..yes, you guessed it…printing the Easter Vigil leaflet! Thank you for some much needed humor on this craziest of weeks!!! These sentiments go for teachers, too! 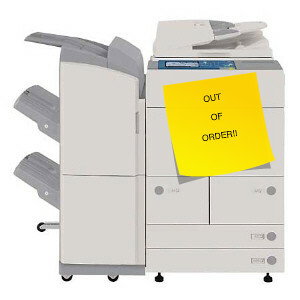 It never fails: when you need it the most, the copier waves the white flag and surrenders to the fate of the repairman’s visit (which is always after the needed by date for the copies!) It was after I retired from teaching (after 25 years full time and 15 as a sub) that I realized the significance of this: too much paperwork (classwork and homework) that really proves nothing. Anyway thanks for the ability to see the humor in a situation.